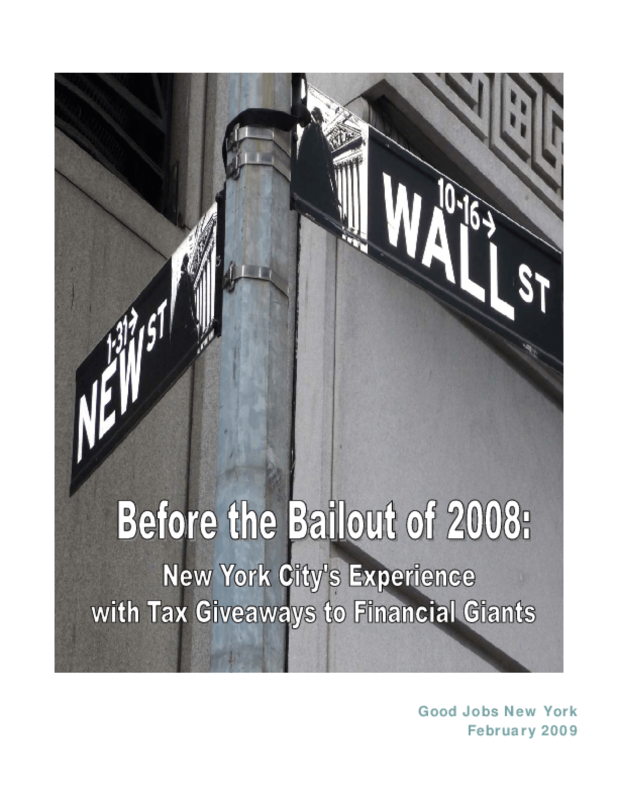 As angry as most Americans are about the hundreds of billions of dollars going to the Wall Street bailout, New York City taxpayers have twice the reason to protest: nearly all of the big financial firms benefitting from a year of federal bailouts including the Troubled Assets Relief Program, or TARP, have wrested enormous tax breaks from the city over the past 20 years. Before granting any new company specific tax-break deals or tampering with corporate tax rates, public officials at all levels of government should review the history detailed here with an eye to making the tax system fair and effective. In the same way federal officials are preparing to overhaul the way the financial system is regulated, New York City officials need to overhaul our economic development system. To end waste and abuse, they need to make the system fully transparent and truly accountable. Copyright 2009 Good Jobs New York.